Hinduism is the oldest living religion of the world. Our knowledge of Hinduism comes to us through many scriptures, which are primarily divided into sruti and smriti. The former contains revelatory scriptures whose source is believed to be Brahman or God himself. The latter are scholarly works written or composed by various scholars and spiritual masters. Until the medieval times, India was a major source of the world literature, which was mostly religious and spiritual in nature. The following are links to resources on English translations of several important religious texts or scriptures of Hinduism such as the Vedas, the Upanishads, the Darshanas, the Agamas, Hindu philosophy, Yoga Sutras, Vedanta, Manusmriti, Kural and so on. There are some links which lead to Hindu studies, Vastu Shastra, Hindu ethics, Vedic mathematics, etc. 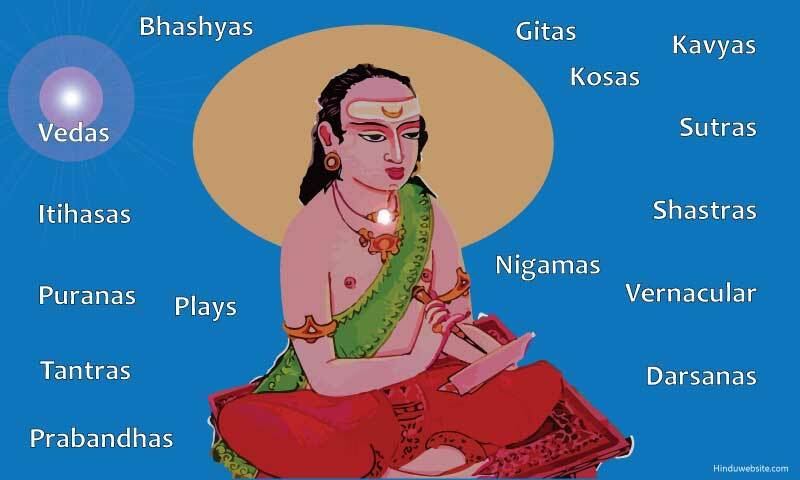 Ramayana and Beyond: The story of Ramayana, its significance and its relevance today. History of yoga, the Upanishads. Disclaimer: Since these are third-party links, Hinduwebsite.com does not have any control over them and cannot guarantee their accuracy or their authenticity. These links are being provided as a convenience and for informational purposes only; they do not constitute an endorsement or an approval by Hinduwebsite.com of any of the products, services or opinions of the corporation or organization or individual. Hinduwebsite.com bears no responsibility for the accuracy, legality or content of the external site or for that of subsequent links. Contact the external site for answers to questions regarding its content.